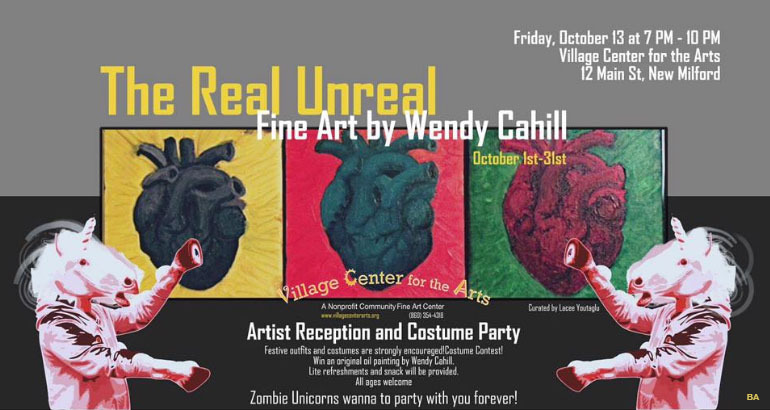 The Village Center for the Arts welcomes you to admire “The Real Unreal” A Fine Art show featuring the works of **Wendy Cahill. Join us Friday, October 13th from 7-10 p.m., at 12 Main Street, New Milford, CT, for a special Art reception & costume party. Festive outfits and costumes are strongly encouraged! All ages welcome to enter a costume contest to win an original oil painting by Cahill. Lite refreshments and snack will be provided. 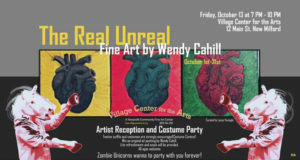 **Wendy Cahill is the owner of Molten Java in Bethel, CT.
WHERE: The Village Center for the Arts, 12 Main Street, New Milford, CT.
“Is there a place between realism and surrealism? Just a slight play on what we see that can create a world we understand but that doesn’t quite exist? As a traditional landscape artist, I found that the more surprising colors and elements of the landscape began to play a more prominent role in my pallet and subject matter. This work is part of the progress of both exploring this process and pushing it further. One of the reasons I love making art is the feeling of being in, but not completely in control of, a dynamic process with endless surprises and possibilities. This work is just a few steps in the myriad directions of brush to paint to surface.